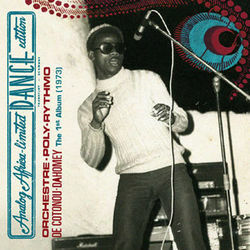 As part of their new series the Frankfurt based specialist record label Analog Africa (http://analogafrica.blogspot.com) have decided to re-release Orchestre Poly-Rythmo's very first album from 1973, simply entitled "The First Album". This legendary band hail from the relatively small West African country of Benin (previously known as Dahomey) which is squeezed in between the musical giants of Ghana to the west and Nigeria to the East. The whole of this coast has produced scores of heavyweight bands but Benin holds it own with this amazing long-lived band from the capital Cotonou. Their musical history is impressive from their origins in the late 60s as Orchestre Poly-Disco, Orchestre El Ritmo, Orchestre Poly-Rythmo de Cotonou through to their current incarnation as just Orchestre Poly-Rythmo. I've reviewed their most recent album elsewhere (other review) but here's the story of the first album. After five years of existence the Orchestre Poly-Rythmo de Cotonou had settled down musically, found the name that they would keep for the majority of their career, signed a contract with Adissa Seidou, the owner of the Albarika Store label and poached the afrobeat and funk singer Vincent Ahehehinnou from rival band Daho Jazz and were really making a name for themselves as a live band. The label wanted them to record a 7" single, but singer Vincent believed that they were ready to record a complete album. They crossed over to Nigeria and recorded at the superior recording facilities in Lagos. But what a quartet of tracks! The album consisted of just four heavyweight tracks - remember in those days of vinyl an LP could only accomodate about 20-25 mins a side - all composed by Vincent. But what a quartet of tracks! Glorious afrobeat grooves as magical 38 years later on (as I sit listening to them now) as they would have been to anyone back then. With psychedelic, tripping, swirling organ, trance inducing cowbells, heart-pumping drums, measured bass, declamatory vocals and little guitar licks that chitter around the outside of the sonic landscape - this is dance music to lose yourself in! Interestingly, the whole was recorded twice Albarika rejected the first one on the grounds of too much background noise - probably due to the equipment used to amplify the organ. The band recorded the whole album again on another session and it cemented not just their sound but their's and Vincent's reputation as one of the foremost afrobeat bands of the world. The album has since become one of the rarest recordings from Benin. this is dance music to lose yourself in! For this re-release the founder of Analog Africa. Samy Ben Redjeb managed to track down the test-pressing of the original recording session and remastered that and the official first release. From that he chose two tracks from each session for this Limited Special Edition release. This is the first time that the original rejected recordings are being released anywhere in the world and they are "Weye We Nou Mi" and "Egni Miton? Nin Mi Na Wa Gbin" (my particular favourite). Vincent Ahehehinnou left the band in 1978 but the band continued and are still out there now with their new album "Cotonou Club" - but that's another story! Orchestre Poly-Rythmo's "The First Album" is due to be released on Monday 13th June 2011 as a CD (6 pages digipack) and as a single LP (180gr) - both limited editions. They will be distributed by Proper Records in the UK; the vinyl edition will also be distributed by F-Minor. You can contact montanez@analogafrica.com for more info about buying the CDs.